Porter Dodson Solicitors & Advisors, a UK Top 200 Law Firm with offices in Somerset and Dorset, is pleased to be supporting this year’s Somerset Business Awards and is sponsoring the Environmental Award. Porter Dodson’s rural business and renewables specialists work with clients across the region to help maximise the commercial and wider benefits of sustainable environmental practices for their businesses. Whatever the sector or scope of their operations, we recognise that environmental measures can have a positive impact on their businesses, including the bottom line. We want to support our clients in their environmental initiatives. The winning company in the Environmental category will prove it has developed good practice in managing waste, reducing energy or other environmental initiative that balances profitability with environmental awareness. Other categories include Family Business, New Business of the Year, Best Exporter, Service Excellence, Business of the Year. Entries are open from 1st June until the end of August and the winners will be announced at a gala dinner in October. 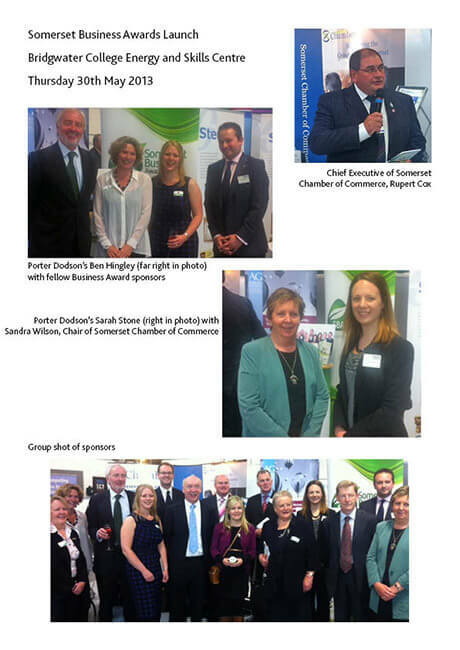 For further information and to enter visit www.somersetbusinessawards.org.uk.